I honestly cannot listen to another genre of music. Lately I’ve been on music overload which sometimes leads to music lockdown and forced to hear something entirely different or even worse: listen to top 40. This in turn does not end up being all that regretful. At times it seems I’m listening to something new and at the same time keeps me in the know on what [us] mainstream folks should [ ] listen to. This is not about T.I., Katy Perry, Rihanna, Kanye or Leona Lewis. It’s not even about M.I.A. 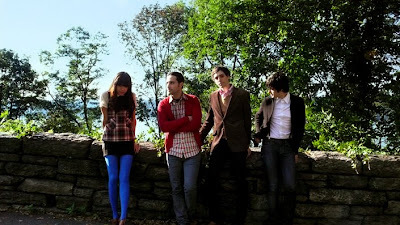 It is about POP… indie pop that is. As much as I would like to write an epic explanation on indie pop (as Pitchfork did about 3 years ago) I could not even begin to undertake what Nitsuh Abebe wrote on the somewhat complex genre, other than he did NOT mention any New York bands. For this reason I give you The Pains of Being Pure at Heart. As one friend would agree, their name is not all that appealing. What is ear-catching is The Pains of Being Pure at Heart take from The Ramones, My Bloody Valentine and Kurt Cobain and presents us with poppy melodies, melancholic lyrics and riffs; together with synthesizers that infiltrate your skin and will not want to make you stand still from beginning to end with their fuzzy warm sounds; either that or it will make you gaze at your shoes as you have never done before. Though they were pinned as a band to watch a year ago from a major blog/web site, the band was clever not to blow up just yet. 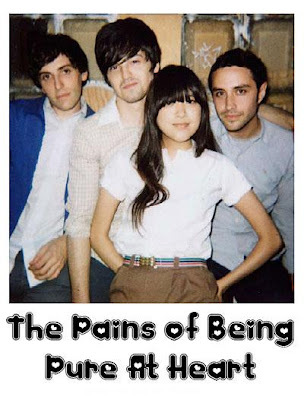 The Pains are about to embark in a vast tour in the UK and will be playing for Twee as F*ck in London. So I’m guessing we will not only be watching, but listening to them sooner than later... [You] can listen now! He won't listen to certain bands if he doesn’t like their name. Dumb! I know, but what can I say? Not to mention he officially banned listening to any band with a two word name, the first being "The" a few years back, plus does not like bands with the word wolf or vampire (with the exception of 3 bands). The sound and music should be the only thing that matters. Though I recognize it’s difficult to achieve this as a priority when [we] look at image first.